Remove Cell Text for Excel is an Excel add-in to remove text from Excel cells based on different criteria and conditions. 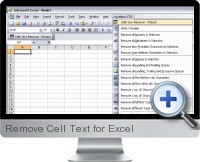 Remove Cell Text for Excel can process as many cells in a selection or range in a single process. Remove leading, trailing and/or excessive spaces. Remove lower or upper case characters. Remove text on the basis of user defined criteria.